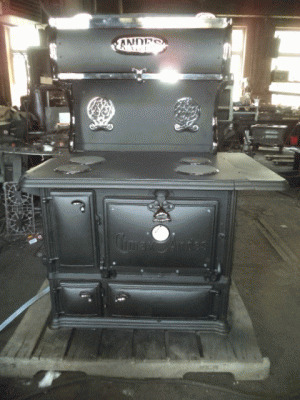 thirty years of experience in restoring wood, coal, and gas stoves. I currently have a large number of wood/coal ranges by Glenwood, Crawford, Fairmount, Premier, Household, Herald, Oakland, Glendale, etc. These are priced in restored condition from $1700 and up depending on rarity etc. I also have many in various original colored enamels. Let me know your needs and I can probably help. In the column below you will find types of stoves I sell and a list of stoves currently for sale. Queen Atlantic with box high shelf and end gas attachment. The Twin Cabinet Glenwood wood range. We have been unable to find any dealer or collector that has seen another Twin Cabinet Glenwood. 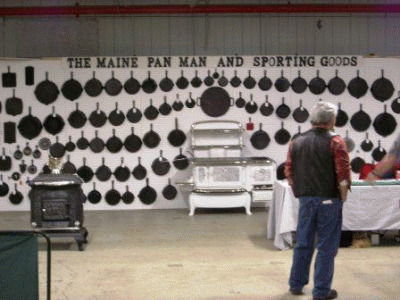 This may be the only one and it spent most of it's life in the Belfast, Maine jail where it cooked for the inmates. Later it was sold at auction and we retrieved it from a nearby barn. 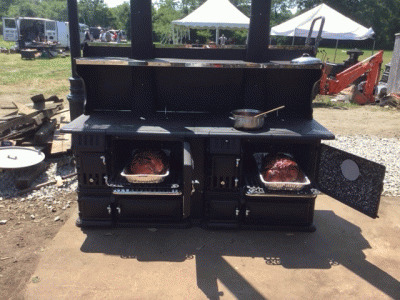 It is almost 7 feet long and we used it to cook two turkeys at the Antique Stove Association annual convention. Both were done perfectly and delicious. We do take trades if you have a stove we can use. We are also open to other trades. My son is a collector of mechanical music: band organs, nickelodeons, disk music boxes etc. He also restores antique marine engines if they are prior to about WW 1. I like antique autos prior to WW 2 and both of us have Federal Firearms Licenses. I have a fondness for old double barrel shotguns. My first Golden Retriever was traded in on a stove. Best deal I ever made. So if you need a stove and have an interesting trade give us a call. I am always looking for unusual stoves. I like large to very large stoves even though I have no place to even light one. We like Oak stoves and any stove with an extention barrel on top. 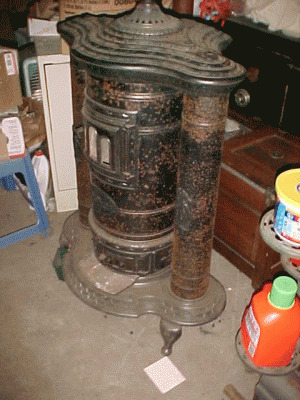 This is a Stewart Round Base Heater model 76 from 1888. It was in a general store that closed back in the 50's and just came to light. They also made a similar stove that was oval and it must be pretty special. 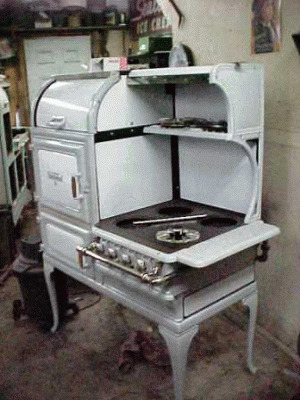 If you have an unusual stove I would like to hear about it and perhaps purchase it. Restored antique or a new range: what is best for you? Antique stoves are fantastic to use and lend a sense of nostalgia to any room, but sometimes they are not the best choice for everyone. While investigating stoves/ranges it is important to shop around so you can become an informed customer on both old and new stoves that are available. 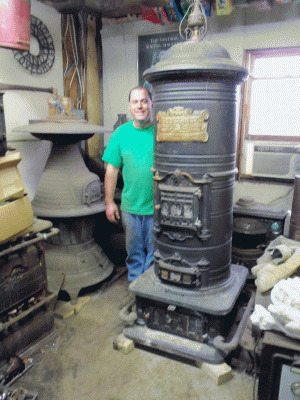 To assist in this process, we have recently partnered with Obadiah's Wood Stoves based out of Montana. In our opinion, they are the most knowledgeable individuals in the country to consult with pertaining to newly manufactured stoves and ranges. - The degree of use the stove will be subjected to on a daily basis. -How rough the stove will be handled in shipping and in day to day use. Although all stoves made prior to 1-1-1981 are grandfathered and exempt from new regulations, there are other factors to consider. Some municipalities are not familiar with the rules and will insist on UL listings for all stoves and will force individuals to install new stoves only. Other times there are local town/state/ or association regulations that pertain to particulate and smoke output from home owners. In both of the above situations a new stove may be the best choice. In other situations, a stove may be subjected to severe handling and severe use as in rural overland tundra delivery on sleds, and constant 24 hour fast burning. 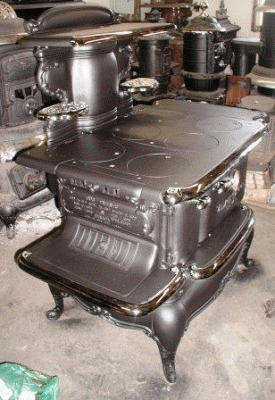 Due to the fact that cast iron is brittle when handled severely and the fact that antique stove parts can sometimes be difficult to obtain, a new range or stove may be your best choice as parts are available and steel construction will deal with some bumps and shocks. Another thing to consider is the local environment where the stove will be installed. If you are going to put your stove in a high humidity and salt laden area, you may want to consider a new welded steel stove as there are fewer joints where "rust jacking" can occur. As close to new as can be without the original crate! The Glenwood K is one of our favorites. 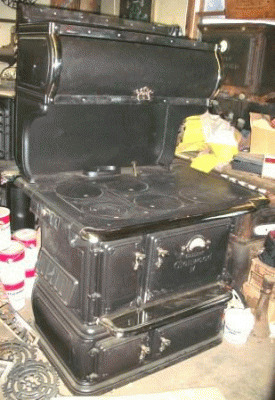 It was produced from about 1912 right up till just before WW2 and was the "meat and potatoes" stove from Glenwood. If you lived with a large family or on a farm the Glenwood K was a trusted range. This one came in the special green and yellow color combination that only Glenwood got just right! It is absolutely radiant in the kitchen and is a real show stopper in this rare color combination. It is in superb original condition and the porcelain enamel is very close to perfect. 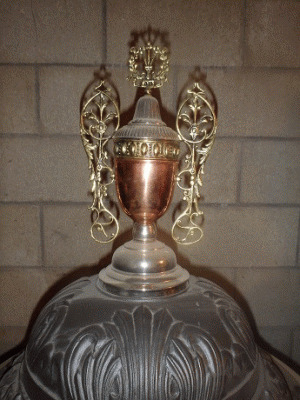 Notice the cook surface is flat and can be returned to the original polished finish. If you are interested in a brilliant "close to new condition" Glenwood K, this may be what you are looking for. Call for details. 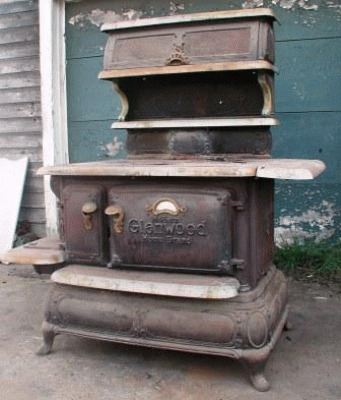 The Glenwood C was the most popular stove in New England for 20 years or so. We see many of them put away here and there around our area. They came in many colors but this is unusual, even for a Glenwood C. We have had only three C models with this strange patchwork enameling process in 40 years. This was found in an old horse barn and has been rebuilt to like new condition. You either love this color arrangement or hate it. Folks all have a definite opinion of the color. 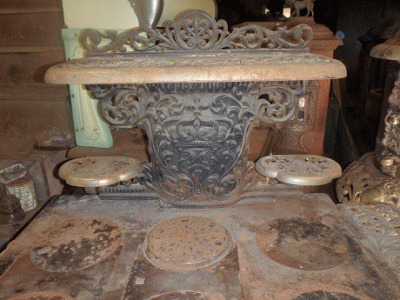 It is currently set up with a new set of coal grates and would be a great addition to any home. Sorry, it just sold. I have many other C models in stock but not in this color. This stove was specifically designed originally both as an ornamental fireplace as well as a stove. Marketed originally as a stove for attorneys offices, drawing rooms, personal library's etc., it was intended to be used as an open fireplace for predominantly ambiance, but also had the ability to be used closed as a fine heater when the weather grew colder. 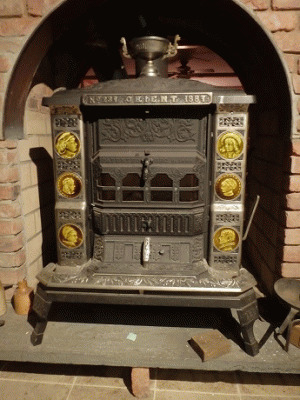 Made in 1889, there is still East-lake decorative style remnants with some more modern flourishes like the green porcelain tiles and birds-of-peace on the front of the stove. Notice in the third picture how even the firebox where the wood is burned is ornamented in typical Victorian style which can be appreciated while in the open position or with the door closed through the mica viewing windows. A nice all purpose stove for wood fuel only. Sorry, sold! 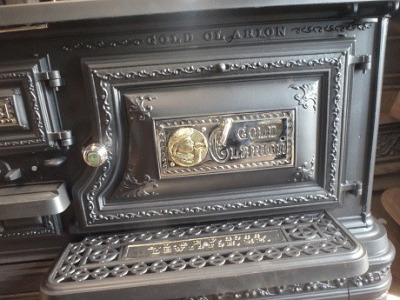 Many folks want the look of an antique stove but with all the modern conveniences as well. Here are two antique ranges that were recently converted to use gas or electricity. These were both ranges that would have been marginal to use with solid fuel any more due to many years of abuse. All interior panels were removed and replaced with new appropriate materials, then the stove was insulated and all new gas or electric components installed. 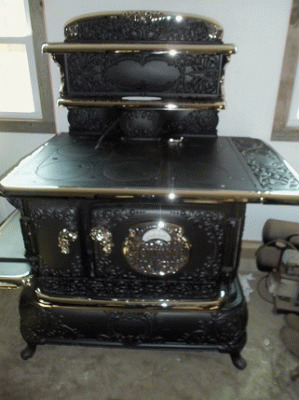 The result is a durable antique stove with the modern conveniences we are used to. 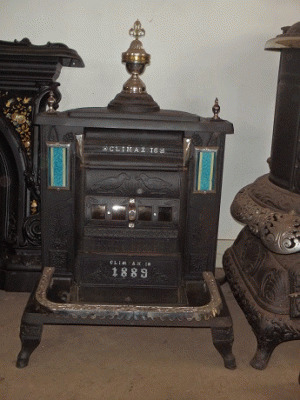 Similar stoves are made today but are far more expensive, lesser quality, and look like caricatures of real antiques. This is a two part process. We have many stoves available for conversion but can not afford do the conversions here in our facility. We have friends that are tooled up to do this work with less expense and faster than we can, and thus we recommend using their service. 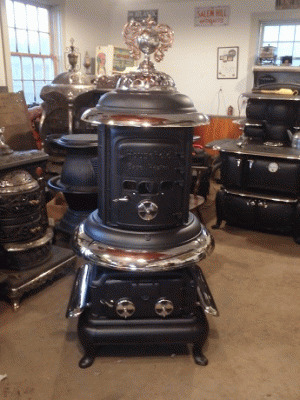 Any stove for conversion that we sell will be transported to their facility as part of the price and the customer (with prior correspondence) will deal with them as to conversion costs. We do not get any kickback from work done at these shops. Several dealers use this same facility; we are just telling you up front so you can save several thousand dollars. 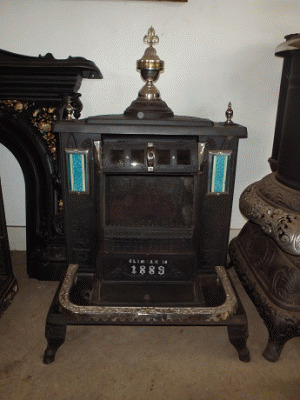 The Barstow Orient is one of the stoves that defines the Victorian era. They are just gorgeous with copious amounts of nickel plate and mica fire-viewing windows. This one is the larger 237 size and is designed to burn wood or coal. If you have a room like a library or formal parlor and want to add atmosphere and some heat, this is just the ticket. Never a plentiful stove, even when new, they are getting very hard to find today; especially with the scarce fully intact Victorian pictorial tiles in the rare yellow-green color! These can be used as a free standing stove or can be placed in front of a fireplace and piped into the existing flue. $3200 SOLD I do have two smaller models. Crown Crawfords are very hard to find. They were made before 1900 and were not inexpensive even then. These are near the top of the crawford line and this is the first I have found. It was in storage in a basement in Boston only a few miles from the original factory. The home was sold and the cellar needed to be cleaned and luckily they called me to remove the stoves. 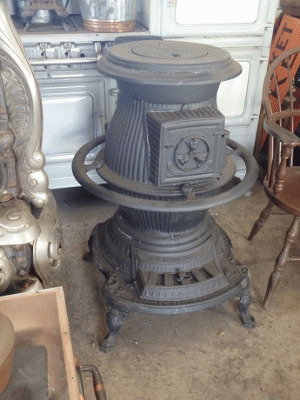 We are constantly told that antique stoves are very rare. Most are far more common than most folks think. 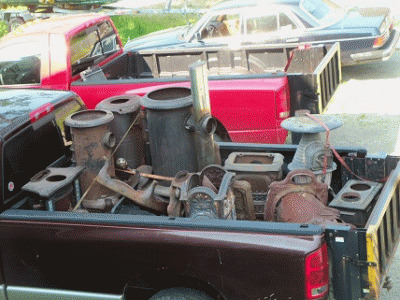 Here are photos of my truck returning with three loads of stoves. The last photo is late April 2013 and is the first of perhaps three loads to be removed from one home. This first load is 5 pre 1900 ranges and about 4 parlor stoves. 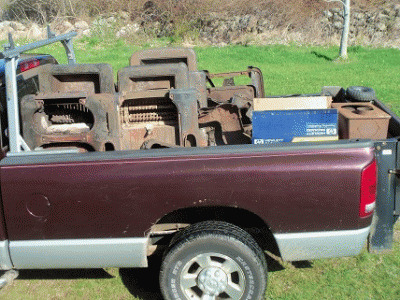 The middle photo is a Glenwood double oven range plus about half a ton of parts we found when the snow melted. 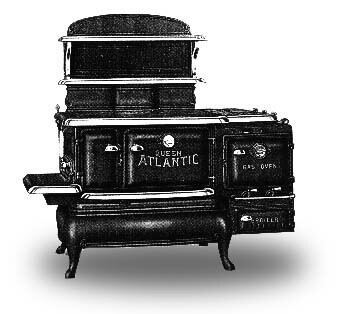 The parlor stoves range from fairly recent to the mid 1800's. 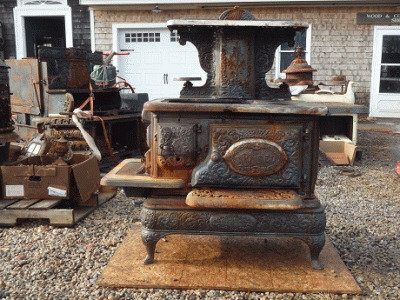 Antique stoves are rarely thrown out in New England and there are still many out there to be found. The Romance of restoring old stoves. Folks are always telling me about the romance of restoring stoves. Well here I am in the attic of a three decker in New Bedford on a day when most folks are at the beach. The temperature up here was very close to 100. The place was obviously the place to put anything that was unwanted or unneeded and was full of old clothes, toys, etc. The stove is near mint condition and I bought it. Then down three flights around corners and into the truck. We work pretty hard for some of our stoves but we also get to snoop around other folks stuff. We hauled two ranges this morning, and I did find a beautiful waterfowl print as well. Its not all greeting customers and counting money. It is very hard work when we would rather be doing something else, but it is all good in the end. I have received many calls from folks planning to go off the grid. They want a wood/coal range for the winter and they want to do some cooking in the summer. The wood stoves tend to be too hot so it would be nice to have some gas burners. Above all they want to be free from electricity and usually fossil fuels. Many companies made the perfect range during the depression but they are illegal today. The reason why they are illegal is that they burn gas plus any other fuel in the oven and exhaust both up the same flue. Too bad as they were exceptionally well constructed stoves. We have taken one of these stoves and removed all the gas fixtures from the oven. 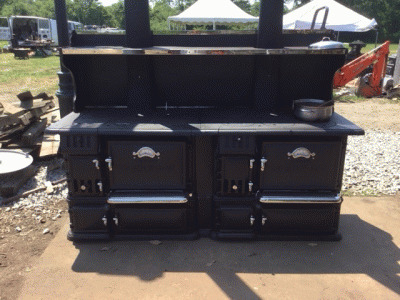 You end up with a 4 burner gas cook surface and a wood or coal fired range with oven. This is legal and should meet the needs of folks who plan to be self sufficient and off the grid. It is also perfect for people with a camp that is used occasionally. The green one above is sold already but we will be getting some more in and setting them up in the same fashion. We completely disassemble, modify the oven to eliminate the gas fixtures and all the holes that came with the gas pipes etc. Then we carefully assemble the stove, rebuild the gas on the surface, add new grates and a firebox liner, and clean the stove from top to bottom. We do not put pilots on the surface burners so that you will not be burning any fuel when the stove is not in use. Customers tell me that a 20 pound grill bottle lasts for months. These came in various colors and we will try to find the color you want. We can set the stoves up to burn wood only or coal/wood. As of March 15 I have 5 in stock ready for restoration. The tan stove is a smaller Glenwood Duplex that we took from a third floor apartment in Newport, RI. Serpentine narrow stairs and lots of fun. 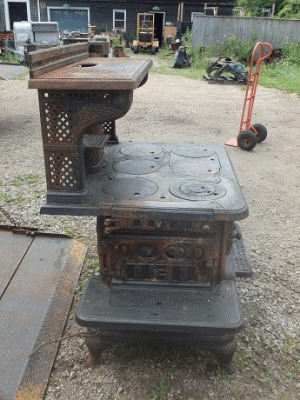 This stove will be restored to new with gas on the cook top and a new set of coal/wood grates in the firebox. 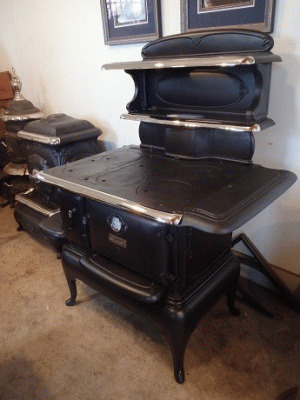 This stove came from the company set up for kerosene and is in like new condition. If you are looking for a nice"off the grid" stove this may be it. The 208 Modern Home Grand was the flagship range from Glenwood. The "modern" term refers to the second series of this range which reflected the public demand for less ornate decoration of ranges starting in about 1910. This is a massive range that combined all the best ideas from the Glenwood designers. This range can be set up for wood or coal depending on the customers wants/needs or a combination of both fuels. If you are a wood burner only, this stove has the largest firebox I have seen in a range at 25 inches long due to the exceedingly rare extension-box feature. If you are a coal burner, you can expect that this range will run overnight on a fresh load of good anthracite while not only doing all of your baking but also a good portion of your heating. A robust, powerful, long-lasting range that can easily bake for twelve people but is just as useful for less. This example just sold . Sorry. There have been only four triple Crawford ranges ever found and I found all four of them!!! Two have double ovens overhead and two have the earlier single oven. The single oven is quite large and has a broiler that drops out of the bottom. You place the food on it and push the button to bring the food up under the burner. Pretty high tech for 1917. 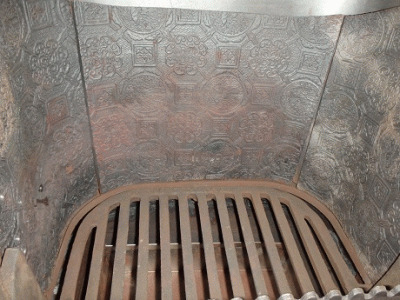 For twenty years we restorers had trouble with wood grates for kitchen ranges. Some, like Glenwoods, were very flat and sagged in no time. Others were difficult to find and/or expensive to make. I finally built two match plates for wood grates. This is the smaller of the two and fits most all medium and small ranges. It is about 17 1/2" long and a little over 8 inches wide. Notice that it is designed with ribs running both side to side and lengthwise. These are now used by most dealers here in New England due to their proven strength. 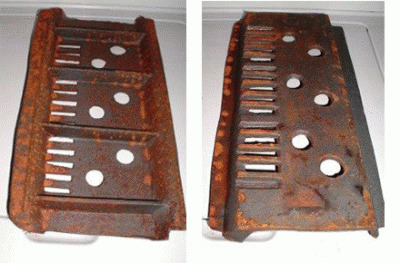 We can easily modify the grate as needed and cut to length for most ranges. We then brick up the sides and you are set for many years. I have sold these for 19 years or so without anyone asking for a second grate for the same stove. In fact, I sometimes buy stoves with the grates still in them from years ago. I also make a larger grate ( 16 pounds) that fits perfectly in the Glenwood E and K models but over time we have found it also fits many other large ranges like the Home Grand, Model Home Herald etc. Available at $125 plus shipping. 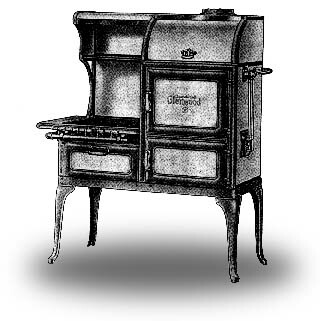 Around WW1 Crawford began to produce the Victory Crawford wood/ gas combination ranges in two sizes, large and larger. 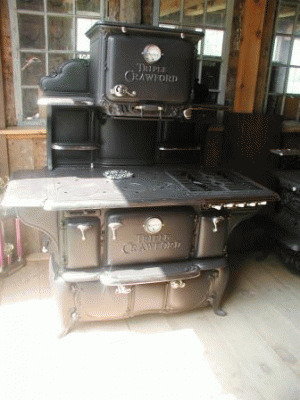 They also produced an even larger stove called the Triple Crawford. They proved to be too large for most homes and were very expensive. The Triple line was dropped in the early Twenties. Here is a perfect example of the enormous range. Starting at the top it has two gas ovens. The left one has the first model Robert Shaw thermostat and the right has a drop broiler controlled by the nickel knob below the ovens. the cooktop has 6 lids for wood/coal, 5 burners for gas. the main body has the firebox on the left with a coal fired water heater, the main oven in the middle, and a storage area on the right that also could house a complicated gas fired water heater. Down below is the ashpit on the left plus storage on the right. The entire wood/coal side is controlled by a single knob that through rods controls everything. This is the king of the wood/gas ranges and grabs all the attention in the kitchen. SOLD. Leonard And Baker was a huge company right next to Glenwood in Taunton. They made enormous numbers of really well designed ranges and sold them under about 150 names. Buy enough stoves and you could use any name you wanted. Many of the early furniture companies sold their own "store brand" ranges. L and B stoves are not fancy, but are very well built stoves and parts are fairly easy to find. This one is one of the small ones and has been set up to burn wood only. These are available for around $2500 and are good dependable little ranges. This one is on it's way to an island off the coast of North Carolina. It will be joining one just like it already on the island. We have many of these smaller ranges that can be set up for either wood or coal. they are reasonably priced and if not done when you call one can usually be finished in a week or two. If you have a camp or want to be able to heat and cook , no matter what, this type of range is a good choice. About 1910 or so Glenwood introduced the Glenwood K model. These are large ranges with a huge rectangular oven and a substantial firebox. This one takes a 24" long stick from the front and is designed for daily use throughout the year. 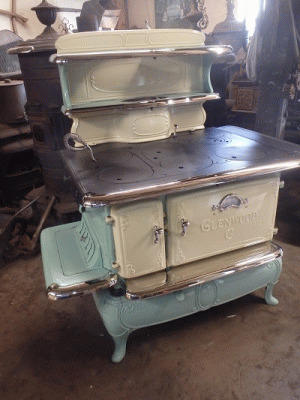 These were the " meat and potato" stoves from Glenwood. They were very popular with folks that had a large kitchen and lots of room for the heat to travel. I have about 6 right now. Some are tan enamel and some are black but all are exceptional ranges. They can be set up for wood only, a combination wood/coal or for mostly coal. The wood only option has a much larger firebox than the others. 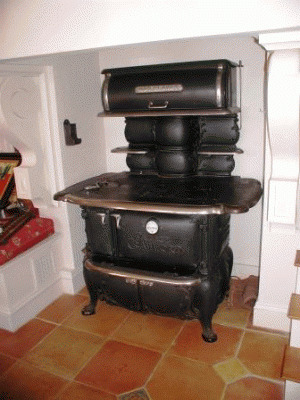 Here is one of the most popular of the Crawfords with the very hard to find Warming oven. I heated my home for several years with a Charm Crawford and they are superb with either wood or coal. 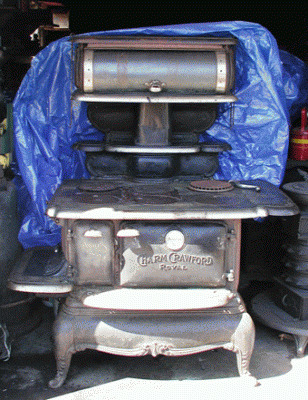 Crawford was one of the leaders in the stove industry back when this was made. This particular one came originally from a homestead in North Berwick, Maine but has spent the last 20 years or so in dry storage. No cracks or breaks can be found in this stove. A great example of an excellent stove. The picture below is the completed range. Glenwood SNJ supercapacity range. This one is in my kitchen and not for sale at any price. I also have another for my son. They have the best insulation sealed inside the stove walls where you cannot disturb it. They have the best thermostat and it is completely ajustable for different gases with just a screw driver and a small wrench. The doors open to the side so there is never an issue with door springs etc. They have six burners on the surface and three small warmers above,two broilers(one horizontal, and one vertical), three ovens plus the warming oven above. 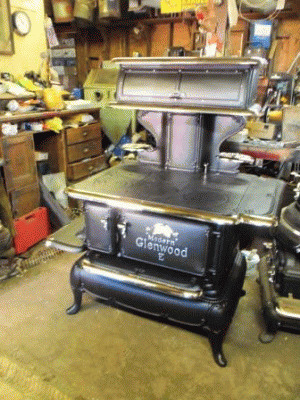 Glenwood pulled out all the stops when they built this model and many consider it to be the finest stove ever made. Targeted to wealthy clients when new, they are proving to be quit scarce. This range was born in the 1890's and set up to burn wood only. It was restored by me some years ago and loved by it's owner. 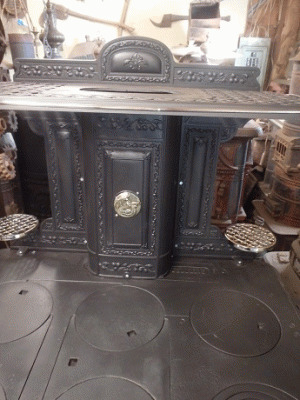 The owner has decided on a larger Coal kitchen range and traded this stove in. It is in wonderful condition , as is, but will be carefully redone as needed .The B model in the Glenwood line was one of the more deluxe models and towards the higher end of the price range. Sold. I have several more similar early B ranges in the barn. We here at the Stove Hospital are called on quite often by prop houses and production companies for period stoves and some furnishings for their kitchen and heating stove scenes. We do have a huge selection of stoves for both cooking and heating that we can rent and or outright sell to prop houses etc. for whatever project you have going on. Prices are greatly reduced in many cases as the stoves are being purchased "as-found as-is" for cosmetic work to be done on premises of the movie lot. Call us to discuss your needs or your current project. Fortress Crawford 8-20 Just finished! Shown in a dusty shop setting with its first coat of paint is a Fortress Crawford undergoing a complete restoration. These are very unique stoves with wings on both sides and the ash pit way down in the base. We love this elegant design because you get the great looks of the Queen-Anne legs with the benefits of having the cabinet base below! They are excellent wood or coal ranges and represent a full-size range in the smallest possible space due to the fact that the left hand ash pit is omitted on this design. I used one many years ago and my wife has suggested I put another one in the kitchen today. Having the ash pit so far away from the grates helps to preserve them and in 10 years of burning coal I never had to replace my grates! The stove also heated the entire home with little to no maintenance. A very able full-size 20" oven range that we can set up for wood or coal and have ready immediately. $3400.00 Available as of 1-17-2018 . What do you do when you are not working on stoves? Well, we have a garden, for one thing. We live on the old Rhode Island Red farm where they raised the hens for a hundred years or so. That plus cow manure and lime is all you need to grow great squash, pumpkins, cukes and tomatoes. 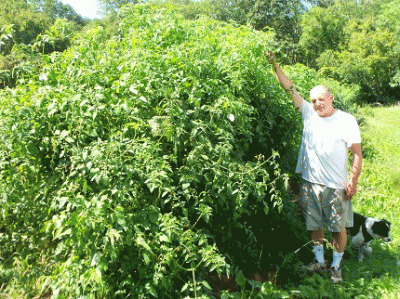 Here is a photo of last year's cherry tomato plants in late August. How can you not garden when you have soil like this. Just finished--a Model Grand World's Fair range with the rare high back with cherubs. One of the most impressive ranges ever made.This is the very late 1900 series.SOLD. 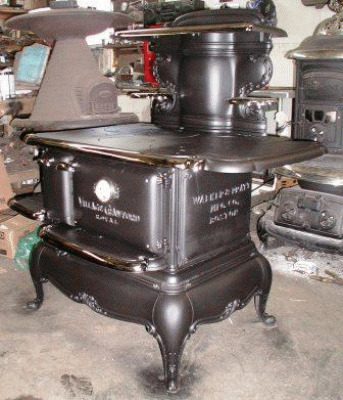 This stove was made by Spicer and Peckham in Providence RI from 1893-1900. This range was made to commemorate the winning of finest range design award at the 1893 Worlds Fair. These are quite rare and are on the top-ten list of must have ranges for serious collectors. Notice the high shelf which reflects the steel girder work from the " new" sky scrapers going up at the time it was made. One of the most ornate ranges ever made and was the pinnacle of design at the time. This range is currently on loan to a museum, but we do have one identical unit that can be sold as a conversion range for modern fuels. Where “good enough” is NOT good enough! 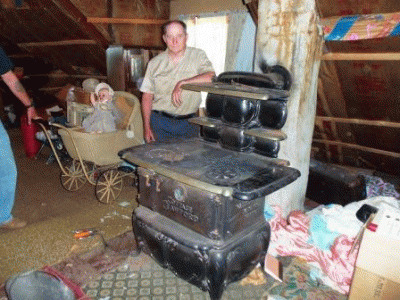 We at the Antique Stove Hospital have noticed a troubling trend in the past months. There have been several businesses around the country that have opened up with very similar names to ours. Please note that the Antique Stove Hospital HAS NO ANNEXES OR SUBSIDIARY BRANCHES, and is not under any circumstances affiliated with these other businesses trying to masquerade as being one entity. 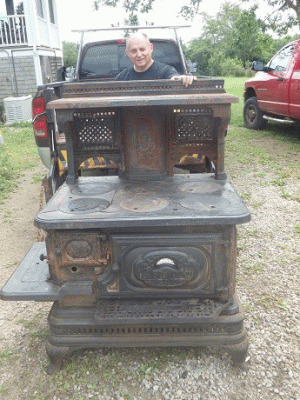 If you are questioning the authenticity of your potential purchase, it is important to make sure that you are buying from either Emery Pineo or Brandon Pineo at the Antique Stove Hospital in Little Compton, Rhode Island. If you have been solicited by ANY other individual who represents themselves as being part of the Antique Stove Hospital, please let us know so we may take appropriate legal action. 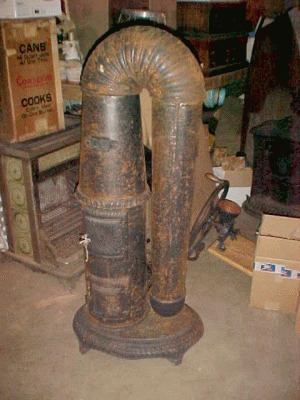 Here at the Antique Stove Hospital we specialize in returning wood and coal stoves to day one condition. 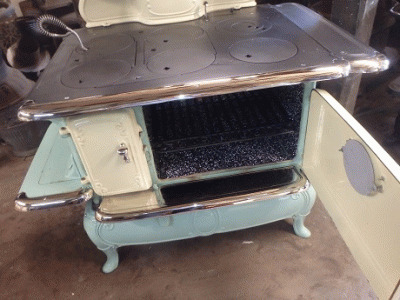 All stoves are totally disassembled, cleaned, parts welded or replaced as needed, caulked, reassembled, painted, new grates installed and nickel replaced. Our stoves are rebuilt one at a time from good original stoves and guaranteed to operate as they were designed. Kitchen ranges and parlor stoves are available. 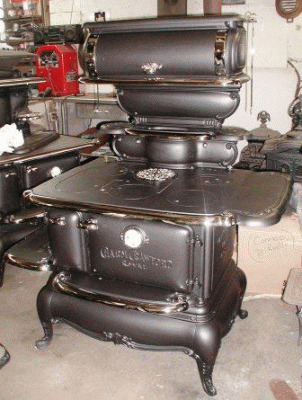 We carry stove that range from AD 1790 to AD 1930. 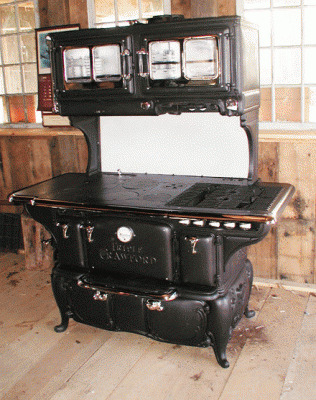 Wood/gas combination ranges were the top of each manufacturer's line. They combined the advantages of both the wood/coal winter range and the gas fired summer range. We restore the solid fuel fireboxes to either wood or coal. The gas fixtures are completely rebuilt for propane or natural gas depending upon the planned use of the stove. Gas ovens and broilers are insulated if needed and thermostats and safeties are added to the unit. We are not a large operation that is restoring stoves on an assembly line. 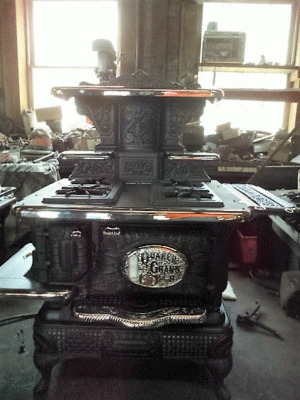 Each stove is personally attended to by Emery or Brandon Pineo and will not leave the shop until it is ready. We do not sell stoves as decorations or curios but for everyday use in your home. I am not a broker. With the exception of castings and nickel plating, all work is done here at the hospital. In rare cases when we are backed up for several months or a year we will give a customer the option of purchasing a stove wholesale with the understanding that it will be delivered by us to a trusted competitor and will be restored by that individual. This is ALWAYS known to the customer and generally is only in extreme circumstances with very large restorations when we are too far behind. 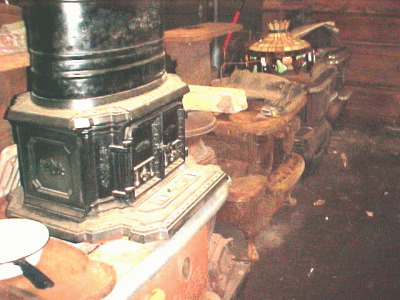 We maintain an inventory of about 300-400 stoves at all times. Call and we can discuss your wishes and the availability of the stoves. I prefer not to accept deposits on sales, but rather ask for payment when you are happy with the stove. Emery Pineo "Paleostoveologist " and son Brandon "Stove whisperer"
THOSE SEEKING RESTORATION SERVICES PLEASE NOTE THE FOLLOWING NEW INFORMATION!!! Changes in business; People used to come in and buy stoves for occasional use and nostalgia. No more! I'm seeing folks that realize that some winter there will be a shortage of fuel and lots of cold people. They are preparing by having a coal/wood range or a parlor stove. Both run on fuels that are available locally and can be stored. Coal can be bought years ahead and stored in the cellar(I buy mine in July , in plastic 40 pound bags on a pallet.I'm still using some that I bought several years ago). When we loose power I often don't know till morning when I try to brush my teeth.--no water!! Most modern stoves use electricity, or worse --a manufactured product like pellets! This year many dealers got their pellet supply in March--almost spring!! I like my winter fuel supply where I can see it. My wood and coal restoration has reached the point where I will be doing mostly the coal/wood end of the business and less in the gas area. We send most of our gas work out to a man who specializes in that work only. Our business has expanded greatly this year. Let's face it, things are pretty uncertain right now. I am currently swamped with folks that are worried about winter heating and the availability of various fossil fuels. My son who originally took a year off from teaching in order to help here, is now full time. If you are thinking of a wood/coal range or heater, please do not wait till the last minute. Order early if you plan to use a stove this winter. We will do our best to meet everyone's needs. 1. I've turned sixty nine and I have started to bury my friends. My very best friend of forty years died on election day. Two others in the month before or after. 3. These stoves seem to be getting heavier. I need help now to haul even the smaller ranges up a flight of stairs. 4. Time is much more important than money right now . Someone else is catching the fish, I have cars to restore, dogs to walk, and sunsets to be viewed. You will see that many of the stoves on this site are sold. I do have around 350 right now in stock and we are restoring as fast as possible but cannot catch up. Folks have realized that a wood range may be very important one of these days and are buying now. If you see one you like you can order now and pick it up when it is done. Deposits; We do not take deposits. 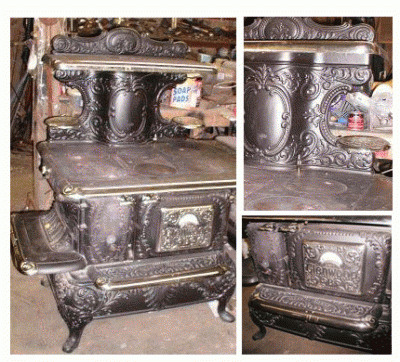 You tell us what stove you want, we restore it, then you decide if you like the stove. If you do not like the stove you are free to walk away. BEWARE OF "FRANKENSTOVES". More and more lately we have been encountering stoves where a dealer has taken a body from one manufacturer and added shelves or other parts from another manufacturer. Some such arrangements may consist of a warming oven of unknown origin, or legs that sort-of...maybe fit etc. We believe that you came in to buy a restored genuine complete antique stove and we will not sell you a stove that has mismatched parts. These are antiques and not getting any younger. As a buyer in the market for a stove you must protect your investment by getting a quality restoration of an original whole stove. If you don't buy here, be sure to ask/ investigate! I do ship stoves all over the country. I am forced to charge for crating as it takes time and pallets, particle board, ,a trip to Home Depot, etc. Recently I have developed a relationship with a broker that has allowed me to get discounts in the 70% range. The trick is that I must pay up front to get the discount. I usually crate the stove, get the price, then have you pay by credit card before pickup. The difference is enormous. A $1000 shipping charge will be more like $200. Delivery to your home by liftgate can also be arranged if you wish. We are often asked if the stove in the photo is the one for sale. We do not show one photo and deliver another stove like some shops. The stove in the photo is the exact one you will receive. 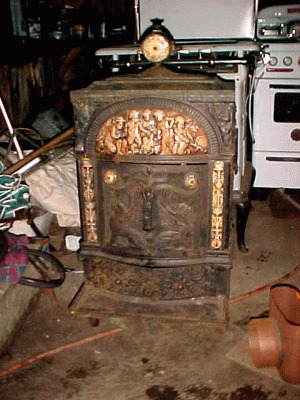 Some dealers use a filed photo and deliver another example or a similar stove to the customer. We will not do that. Many of my stoves say SOLD on the website. 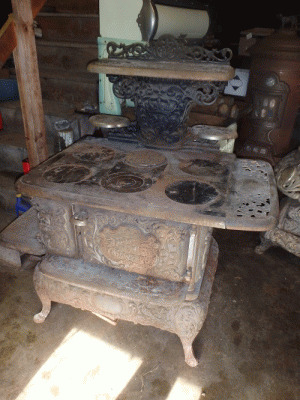 That means that that particular stove is sold, however we may have several others of the same make and model available. 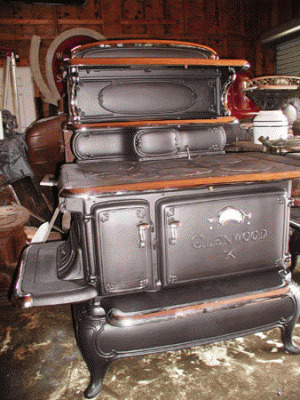 An example would be a Glenwood C. We usually have 8-10 around at all times, but we would rather send you photos of the exact stove we have to restore for you before you decide on a stove. We are trying to be completely honest about the stove you buy. It is a big investment so take your time, as you will have to look at it for many years! 1. My supplier of firebrick just closed after a lifetime of service. 2. My supplier of sand blast materials just closed after being in business since 1837! 3. My good nickel welding rod has been discontinued as it was too expensive to make. 4. My nickel plater has closed and moved and is no where near up to speed. 5. Every item I buy to work on stoves is getting more expensive at an accelerating rate. We have been getting lots of calls from folks with gas valve problems. The valves on antique gas stoves NEVER wear out. The proprietary sealant inside them does get old and dries out after 50-60 years. They get hard to turn or you can smell gas leaking from them. You do not need to discard the valves and replace them. We can rebuild these old valves and make them like new. Call and talk to Brandon if interested. Coal versus wood in ranges. I own a 7 acre wood lot but I burn coal. In places where wood is plentiful like Maine, wood makes lots of sense. In my area I have a choice and have tried both. Coal in a rebuilt range will burn for 8 - 12 hours at a time without any tending. There is no dust or odor if you are using it properly. It does take practice but once mastered is great to use. There is no danger of a chimney fire with coal. If you just light the stove for cooking or special occasions then wood is your best bet but if you heat full time think a little about coal . 1. Glenwood thermometers come in two types. The early and the late ones. The late ones always work and the early examples usually don't. Reproduction thermometers are a poor replacement for an original, and usually come from China. My son has developed a method of rebuilding early Glenwood thermometers. It does require that the original be complete, but if it is, it can usually be made to run like it did one hundred years ago. It is a long, complicated process but will cure the problem forever. Call and ask for Brandon about this service. 2. Stove lessons. If you buy a stove from us , we will gladly hook it up in our showroom and teach you how to run it. We do charge a small fee for this since we need to do set up, get stove pipe, fuel, etc. It is a fine way to eliminate most of the questions folks have when they get home and actually plan to use the stove. Bring some "fixins" and try cooking on your new stove. The fee is $75.00 for this service which covers the time of the technician and fuel etc. 3. Video disks. We are currently working on making CD's available on how to run various stoves such as: base heaters, upright coal stoves, ranges, oak stoves, and others will be available. 4. We are building a large addition to our shop. It will house a Goff wheelabrator and large generator. This will speed up our business and result in an even better product. Currently we cannot sand blast below freezing but with a wheelabrator there is no problem. It will also eliminate all dust leaving the shop and be more friendly to the local environment. Be careful! I paid way too much for the first few stoves that I bought. Now I often walk away and pass the stove by. Here are some good things to keep in mind when buying a stove. 1. 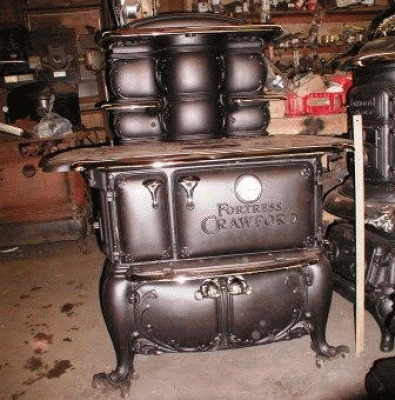 Stoves on Ebay and Craigslist are usually MULTIPLES of the actual value. 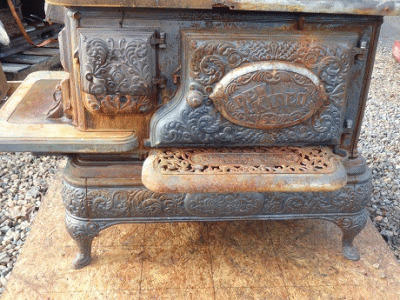 I often see stoves advertised for more than we sell them for when they are restored. 2. Most stoves are not "rare". Maybe you haven't seen any like it but we have. When you start looking you would be surprised at the number of ranges around. Many just have not been looked at in years. 3. Not all old stoves are expensive or even desirable. 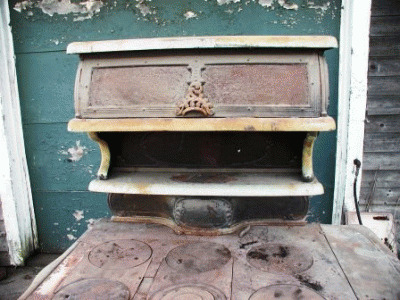 Many are in such poor shape that they are really best used for parts for other stoves. 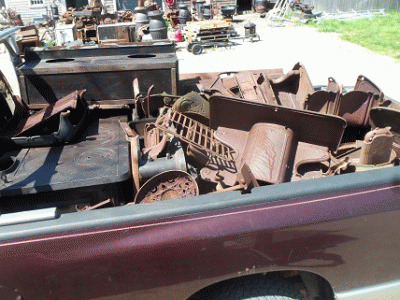 Some will need so many parts that they can't be realistically restored for a reasonable price. 4. Some are just illegal and of little value. Gas/wood ranges with one oven usually fit this category. 5. Some are rare. That can be a problem. If you need parts they may not be available. That lowers the value of the stove. 6. Some are just for museum pieces or decorations. They have to be bought at a value that will let you just set them aside to look at. 7. If you pay too much, you will actually spend more in the long run than if you came in and just bought a stove from a restorer. 8. Do not use a stove without it being rebuilt. 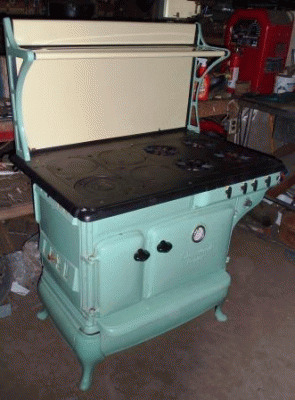 I have only seen 2 or 3 that did not need a rebuild and that includes new old stock stoves that were never sold. 9. FRANKENSTOVES! This is a stove that is made by combining pieces from other, usually unrelated stoves. 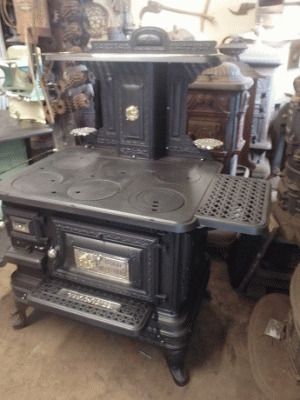 When you buy an antique stove you should expect to get the whole stove and not a base from one company, a body from another company, and a back made by someone else. Some dealers do this. Look the stove over well to make sure the parts are marked from the same manufacturer. 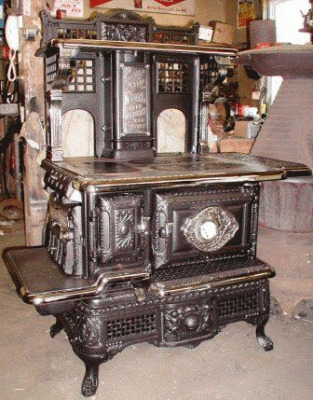 An antique stove can be an investment , but not if it is a conglomeration of parts from other stoves. We usually pay from nothing to about $300 for ranges. Some are more but they have to be very good, very unusual, or something we have an order for. When you buy you need to figure in the cost of restoration. Nickel can run to $600 or so, a rebuild can run $1500 to do it correctly, Grates can run to $3-400. Are any parts missing? They need to be found and paid for. That can run into real money. 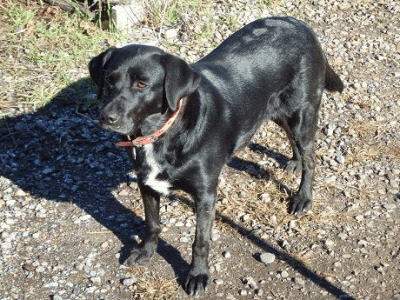 Magellan: Rest in peace our eternal friend. 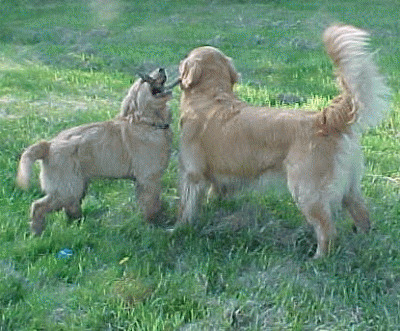 Ptolemy is training a security assistant named Magellan. 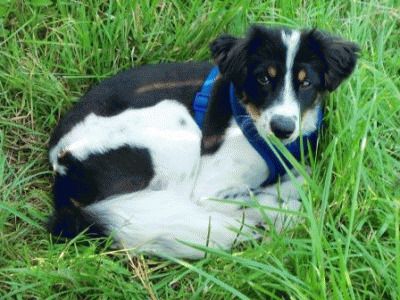 Just twelve weeks old in the above photo; it is hard to believe that over ten years has passed since this was taken. I am very sad to have to report that our faithful friend Magellan has lost his battle with liver cancer on October 31, 2014. He was a faithful friend who will be sorely, sorely missed. The shop is not as fun or complete without his presence, and his passing has created quite a void. Loosing good four-legged friends such as he is not getting any easier over the years, but we know he is not in pain and he passed with a full belly of the finest Angus steak. We will miss you old friend, rest in peace. 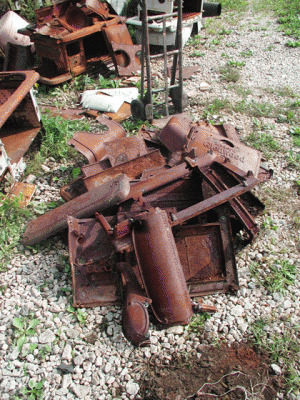 It is becoming harder and harder to find certain parts and pieces for some old stoves. In certain cases it is prudent to go to the trouble and expense of creating a pattern mold for the missing parts so they can be cast as needed for the future. These patterns that are used by the foundry to cast the parts are generally made from wood and carefully fashioned so the iron parts come out correctly. This is a time consuming process that requires that we source/use certain pieces of equipment that may or may not be available any more... like the stove parts themselves that we are trying to make! 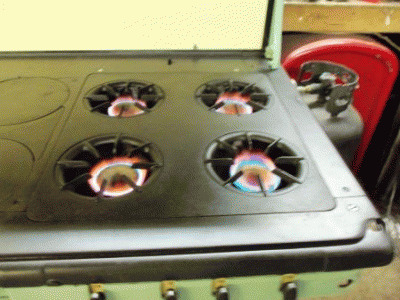 Recently, we were able to source a piece of equipment that we have been seeking for years that will enable us to make very accurate patterns for stoves. 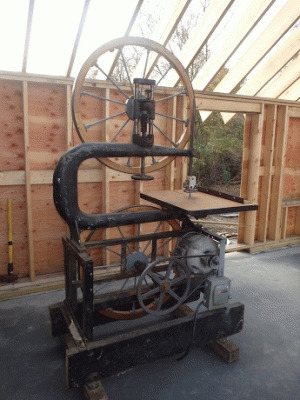 The Parks band-saw depicted above is exactly what pattern makers would have been using in the stove foundries to make their patterns. A band-saw with these 36" wheels makes it much easier to make the cuts needed to accurately generate our wooden patterns. A real triumph for us, and another relic from the past that will not be going for scrap, and one that will be utilized for the exact purpose it was originally intended to do a full century ago! Meet Gracie. She is a rescue dog and when we got her she was unable to climb into my car. Fat, dull coat , and little interest in anything. She had spent most of her time in a cage. She has discovered that 10 acres is a treasure trove of stuff for a dog to do. Free to roam and investigate as she pleases she has lost 10% of her body weight, has a shiney coat and runs all day long. Addicted to tennis balls and frisbees, she also loves to hunt for mice, chipmunks, and generally keep the place free from most anything. She is now a happy, energetic member of the family. This is Shep. He is a rescue dog that was scheduled to be put to sleep shortly after we saw him. He was skinny and had been abused badly but has finally struck gold. My son and his wife have adopted him and he is fitting in well here at the Stove Hospital. Magellan has become a big friend and part time jungle gym. Here he is resting between attacks on Magellan. If you drop by he will probably be here to help greet you. The early stoves are very uncommon but we do see some ranges from time to time and they are pretty good stoves. Only two oak stoves have turned up. One was a size 20 and this one , which is a size 30. I found the stove without any grates and worried about how to find some. Then at 3 AM I remembered that Leonard and Baker later produced the Wing's Best Base Heater. In the morning I tried some wing's grates and they are a perfect fit. Even the fire pot is exactly the same. Obviously Leonard and Baker wanted to get into the base heater market and pulled the old patterns off the shelf. Also, the grate system will interchange with the Glenwood 30 oak stove. 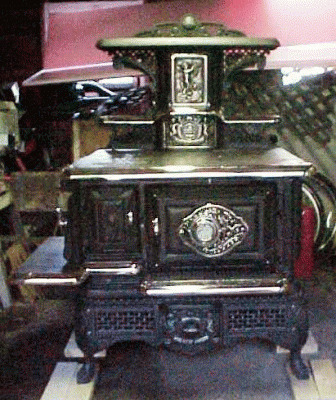 Crawford made a great oak stove around this time and the nickel trim on their stove looks very similar to the Glendale. Since the Glendale predates them both I think both companies peeked in the windows at the Somerset Foundry. Possibly an early example of industrial espionage. Glenwood, Crawford, and several other brands are the ones most people are familiar with in this area. There were many other manufacturers in this area. They all made excellent stoves but are not as well known as the ones mentioned earlier. 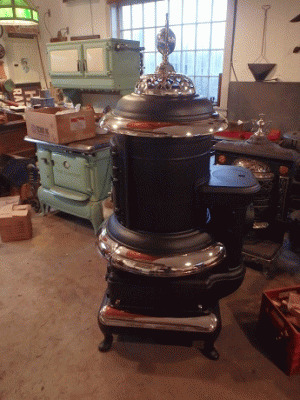 We have a large number of these stoves on hand. They are every bit as much stove and many of them are actually better. We can sell these stoves at a discount because they are not the "big" names. If you are looking for a great range at a very attractive price look here for some great deals. An example is the Wincroft range we just listed. 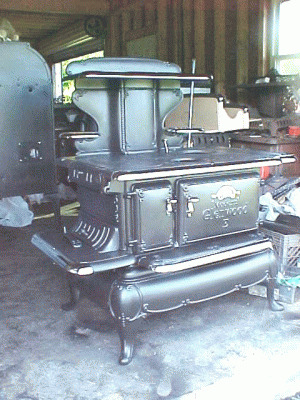 It is a very well constructed stove in fantastic shape but is several hundred dollars less than a similar Glenwood. Just a word about ranges. When they were originally sold, you purchased the base range which was the base and the body. Then you added options till you arrived at the stove that met your needs. These options included the gas side car (left or right or both), gas side shelves, overhead gas ovens, water tanks, internal water heaters of several different types, a choice of 6 or 8 different grates, through the floor chutes for ashes, cabinet bases, colors, warming ovens (above and below the range), kerosene set up, left or right firebox, and many more choices. If you can think of it---somebody built it. Sometimes we have a difficult time finding some configurations as they may have been very unpopular at the time of manufacture or proved to be less durable than other choices. If you have something in mind I will try to find it for you. In New England many folks never throw things out. This garage is one example of someone that could not part with the old stoves. 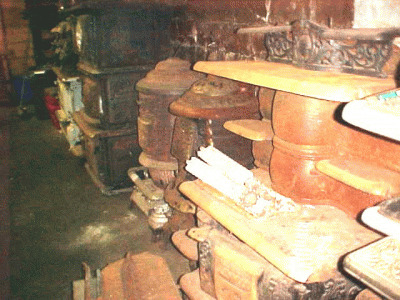 Over the years it developed into a small collection of stoves. The place is now sold so they had to go. This is the third such garage I have been in this year. Two truckloads came from here to my barn. They will all be restored and put back into use. Many of the combination ranges are illegal today. Call with a description BEFORE you buy one and we can help you determine if it is one that can be serviced, or if it is best left where it is now! THIS CAN SAVE YOU LOTS OF TIME, MONEY, AND GRIEF! 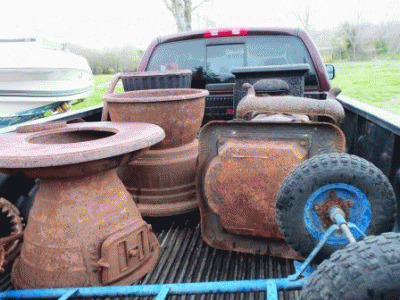 These are all odd ball stoves from the 1850's- 1880's. I collect stoves that are old enough that they will never be called on for heat again. Many of these are close to unique and all of them reflect the best thinking of their time. These were the high tech implements of the past and should be saved. I have perhaps 100 or so and I will continue to collect, repair, and store them. 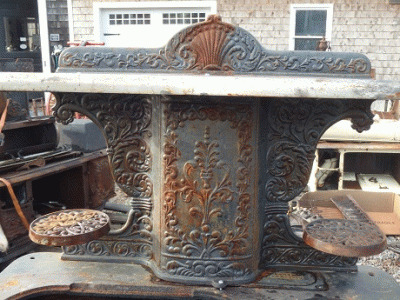 My son, the history teacher, takes a new stove each week to his schoolroom and displays the best ironwork of each era. Eventually they will go into some museum for future generations to appreciate. If you have a strange old stove that is probably too old for use. I would like to know about it. I do not sell these but will eventually donate them somewhere where they will be safe. We prefer stoves made in this area for several reasons. 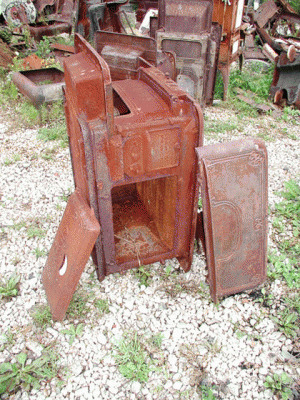 One is that many stoves manufactured in the mid-west are part sheet metal and part cast iron. The pieces are riveted together and a rebuild requires drilling out all the rivets, removing lots of asbestos sheets, and putting all new rivets in when assembling the stove. The parts that wear are usually buried under the oven or in the back. I would rather eat a worm. Stoves in this area are plentiful and come apart easily. We can disassemble, replace parts etc., and reassemble without worrying about whether the parts will fit or not. If we have defective parts, they can be replaced or recast as needed. You end up with a better product. Many times an inspector will say a stove must be UL listed. This rule only applies to stoves manufactured since Jan. 1, 1981. Any stove made before that time is grandfathered but must be looked over for damage etc. The rules are found under the BOCA codes or the ASME codes, " solid fuel room heaters" in the exemption section at the end. 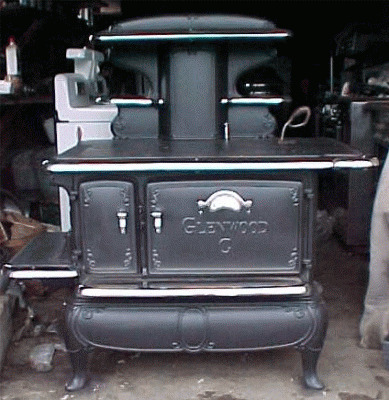 This is an example of a Glenwood 508E range that spent many years in a barn and at least two or three outdoors. It looks to be complete with no breaks but it needs a complete rebuild. What is involved in properly rebuilding a kitchen range? I have seen many examples of shoddy work in what was supposed to be a rebuilt range. Examples include just taking the cook surface off and sandblasting the stove whole to just a good washing with detergent. All may look good upon completion, but only one will last. See the below sections for the correct, long lasting rebuild process. This is my son's name for what kills old stoves. There is caulking in the joints of the stoves. Over the years the stove heats and cools many times plus it sits around all summer and gets damp every day. expands. eventually it breaks the corner brackets and panels begin to move around which breaks more tabs. In the end the stove falls apart in a heap. Rustjacking is one reason why a rebuild is so important. 1. We disassemble to the last nut and bolt. Everything needs to come apart so we can inspect all the parts and replace missing or badly damaged parts. Most dealers don't do this but claim they do. Notice that even the base has been broken down. I do this so I can paint the inside of the legs where they touch the side rails. If I don't do this there is a chance that rust could form in the joint and travel under the paint. It isn't that bad for the stove but it is ugly. 2. It is at this point that I usually find a number of cracks , broken pieces , or worse yet, something that was fixed years ago by that uncle that knows everything. I usually end up unrestoring these parts before I continue. 3. Everything goes into the sandblast room and is sorted and set on the blast table. I use a system that recirculates the sand so I use it several times. It breaks down into finer particles and actually works better after it has been used a couple times. ones. Certain models seem to break in certain places so I try to reinforce these points. Lids often need to be welded because they leak around the lifter holes. 5. The stove parts are painted in some cases. The front frame needs to be painted now so I don't paint the inside of the oven later. I like to paint the oven walls before assembly. All the panels are painted with our two part black and white high temp. paint.. Painting while the stove is apart assures that there will be no overspray in the oven. 7. The firebox is put in place. This can be a wood bottom, coal/ wood grate, or coal only bars. 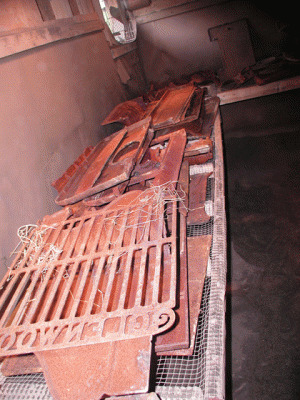 New grates can be found, but my foundry work is done in Wisconsin. They do great work but I have to pay shipping both ways plus the cost of the work. We then line the box with refractory material appropriate to the application. 9. Nickel is replaced on the stove. I have a very good shop. Not cheap, just good. A kitchen range will run from about $300 up depending on the complexity of the nickel for that model. The price also seems to vary with golf scores, wind direction etc. One of the reasons stoves wear out is not that they are used each winter but that they are not used each summer. In summer the house gets warm during the day. At night cool air falls down the chimney and moisture condenses inside the stove. This water mixes with the ash and forms harmful chemicals which eat the iron from the inside out. Stoves with water tanks are often paper thin around the tank. Be very careful when purchasing these stoves. It is best to disconnect the stove from the flue in summer to eliminate the problem. We paint our stoves with a high quality stove paint. Rust has never been a problem for us. One way to eliminate the problem is to rub a small amount of cooking oil into the cook surface in spring. Just put some on a rag and rub into the metal. Get rid of the rag right away to prevent festering and fire danger. The stove will smoke some in the fall the first time it is lit, but it will soon go away. Sometimes some of the stove cement will stain the stove around joints. I take some cooking oil on my finger and rub it into the area. In ten minutes the stain goes away and never comes back. I have no idea why. 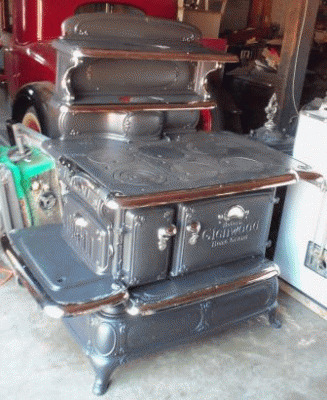 Most stoves advertised online like Craigslist or ebay are overpriced. I cannot buy these, fix them , and break even. Everyone thinks they have the only one around. Too much Antiques Road Show and American Pickers. If you cannot sell your stove it is priced too high. If you want to buy a stove, don't be afraid to walk away from a deal that seems wrong. I do all the time. When looking at a stove check the corners, get a flashlight and look around in the oven, in back, and underneath. Especially check the wall between the firebox and the oven and the corners. Can the stove be fixed or do you need to find another like it to get one good one? Keep in mind the cost of restoration. Nickel runs $300 UP for a range, Welding rod is $77 per pound, paint is not cheap and I buy it by the several case lot. Sandblasting is quite a project. Don't forget grates. A new set from a foundry(if you have the original patterns) can run between $200-$300. The firebox liner will run $50 or so. Add it up before you buy and find out it's too expensive. Most antique ranges can be purchased for under $300. Do not buy wood/ gas combos without checking. Most are illegal today. 1. Does it have grates? If not you need to find a set. Some folks use thick steel plates in the firebox. They expand more than iron and will crack the box. Can you drop wood down in the ashpit? Yes you can, but it will blow a hole in the oven wall before long. The folks that designed these stoves knew what they were doing and you should do your best to get the stove back to what it was in the beginning. The autos today are pretty dependable after 110 years or development. The wood/coal stove industry in the USA started in 1627 and lasted untill WW2 or so---over 300 years. They got it right!! 2. "My friend says If you burn wood you don't need a liner in the firepot." I hear that all the time and it is wrong. I also get calls all the time from people wanting a new firepot. Don't listen to the oldtimer that tells you bunk like this. We have liners for almost everything. A firepot with a proper liner is good for a century or two. Firepots are expensive because so many people have used them without liners. 3. The stove is just like new and ready to use. NO!!! We bought out a building full of new old stock ranges from the 1930's. They were still crated and every one needed a rebuild. The caulking in the joints breaks down, the joints develop rust, the joints fill with smoke and particulates, and the corners are under great pressure. A rebuild puts everything back to day one and the stove will last a lifetime. 4. The stove gives off a ton of heat, it even gets red. OUCH! The stove should NEVER get red. If it does, it is overheated and will warp, crack, self destroy, etc. The stove is leaking air, or you need a damper, or you need a liner etc. 5. Dampers, I keep hearing that you need no damper or a barometric damper. Both are wrong. If you have no damper you will just send the heat up the flue and kill the caribou... not to mention fatigue your stove. Do not confuse the controls on the stove for dampers. The controls inside the stove are draft directional controls that send smoke up the flue directly, or force it around the oven cavity. You do need an old fashioned manual damper in the first section of pipe above the stove. Some modern installers insist on a barometric damper. They are required with most modern stoves but will kill any chance of heating with an antique. Go to the hardware store and buy a plain old fashioned damper. They work. Glenwood 308 Home grand with warming oven. In 35 years of collecting and restoring stoves I have never had a chance to pick up a Glenwood Home Grand with the warming oven. They are just very rare. 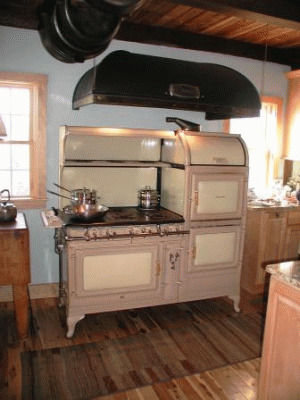 The stove was the top of the Glenwood line and the double mantle back was very impressive. The warming oven was infrequently ordered and are exceptionally rare today. This one was put in a dry cellar around 60 years ago and just came to light last week. IT has lots of dust and assorted crud on it but it will clean up beautifully. The stove is complete, not broken up, and not pitted as many are. 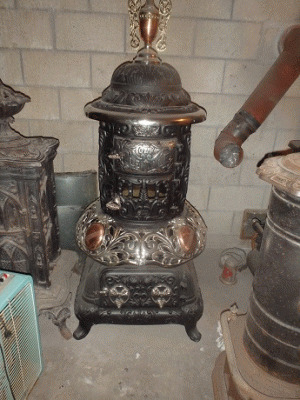 This is an exceptional example of a rare stove that I have never had a chance at before. I would like to set this one up for coal or wood burning. 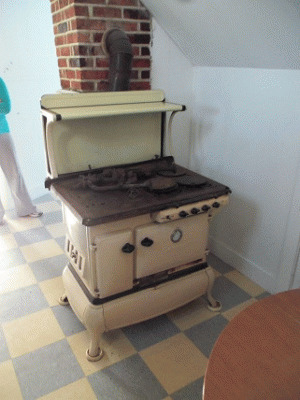 I used a similar stove without the warming oven but removed it because it made the house too hot. Don't let the photo trick you. The stove is 56" long and very subtantially built. If you have the need for a great stove and lots of heat, this may be the ticket. Here is a photo of the back of my truck. We can see that everyone will want to abandon oil as a heat source this coming winter and are laying in a supply of stoves that we believe folks will need. This is one day's worth. We will continue to buy as many as we can buy reasonably while the weather is warm. I think this fall we will simply be out straight and unable to leave to get stoves. 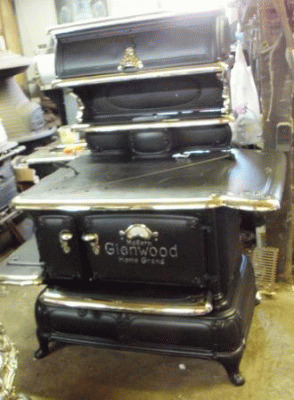 In this load are a perfect #16 Railway King, a Perfect #18 cannon heater, a Cherub Glenwood wood parlor, and a superb Grand Glenwood Parlor stove. The welding rod that we use for cast iron is 99% nickel and runs around $77.00 per pound. I am hearing from some folks that you can use regular 6011 rod to weld cast iron. It costs a dollar or two per pound. I agree that you can do this and the welds look good. However, The cheap rod expands differently than cast iron and once the stove is used a few times a new crack will develop next to the weld and follow the path of the old crack. We have several here for repair because of this. We will continue to use the expensive rod as we have had no problems with it and have been called on to repair many welds made by the cheaper rod. When looking for a restorer this is one of the invisible things that can make a huge difference down the road. Base heaters came in around 1905 and were produced by several firms in Taunton, Mass. The smoke travels up the main body, down the back pipe,under the ashpit, back up the back pipe , then out of the stove. It may travel 10 to 12 feet inside the stove so that a maximum amount of heat is transferred to the room. These represent the peak of coal burning technology and are serious heaters. They may burn coal or wood as desired. They also have lots of nickel trim and are impressive from any angle. I have models from Glenwood, Wing's Best, Crawford, Tessier, and Herald. They start at $3800.00 and up depending on model and size.